Total: 1 hr. 45 min. 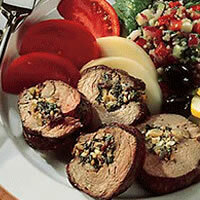 Garlic, feta, and pine nuts contribute to the savory flavor of this stuffed lamb loin. In medium skillet, heat 1 tablespoon olive oil, cook onion and garlic over medium heat for 3 minutes. Mix in spinach, basil, sundried tomatoes, pine nuts and 1 teaspoon lemon pepper. Cook additional 2 to 3 minutes until spinach is wilted. Mix in feta cheese; set aside. Remove all visible fat from meat; slice halfway through meat down center lengthwise. Cover with plastic wrap, and with meat mallet pound to 1-inch thick. Place filling down center of meat; roll and tie with string at 2-inch intervals. Brush with 1 tablespoon olive oil and sprinkle with 1 teaspoon lemon pepper. Place on rack in roasting pan and roast in 325° F oven to desired degree of doneness: 145° F for medium-rare, 160°F for medium or 170° F for well. Cover and let roast stand 10 minutes before carving. Internal temperature will rise approximately 10° F.